So about a week ago, I noticed the status on one of my many Topps redemptions had changed from "Pending" to "Shipped". Oddly, there was no confirmation number, I kept checking back in and no updates, and no card in the mail. So I sent a few e-mails to Topps Customer Service, nothing happened (surprise surprise). Finally, out of irritation I sent a tweet to @toppscards. They hilariously responded, if you follow me on twitter, you probably saw the conversation. For those of you not following me on twitter, why not? (@thedimwit). Not too shabby. Semi-legible auto, great condition on the card, no smudges or bent corners. 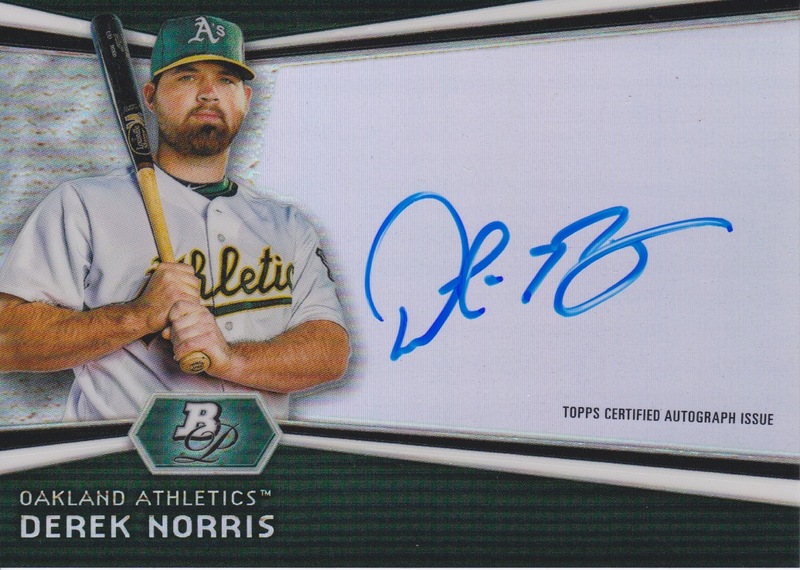 I don't know this Derek Norris guy, other than I know he went from Washington to Oakland in the Gio Gonzalez deal. But I'm sure with the Astros' move to the AL West this year that I'll get to see this guy play against us a bit. It is firmly in the trade bait category, so all you A's fans out there: I expect a bidding war. Haha! Derek Norris is alright! Got pushed back on the depth chart because the A's signed John Jaso though.